Quinoa Salad with charred corn, avocado, poblano peppers, cotija cheese, and a simple cilantro lime dressing. This healthy gluten-free salad is a summer favorite! Yes, I am posting another quinoa salad. I hope you aren’t rolling your eyes at me right now because you need this Charred Corn & Avocado Quinoa Salad in your life. It’s a keeper! I know I kind of have a quinoa obsession, but I post what we eat and this summer we are on a quinoa kick. I hope you are getting on board with quinoa because it’s pretty amazing! 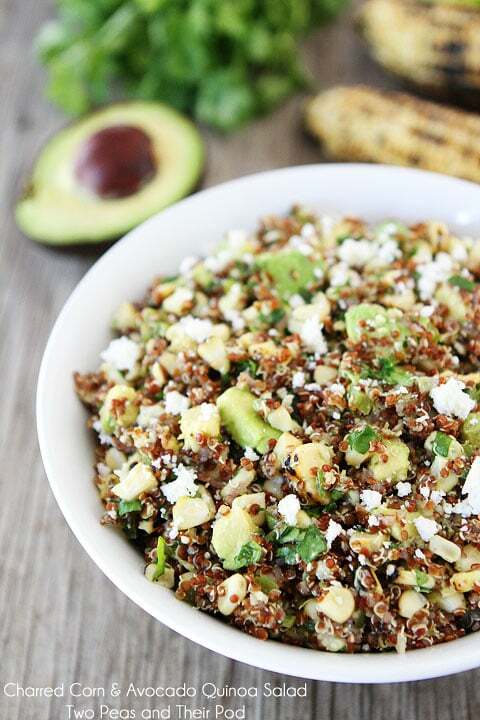 And if you haven’t tried quinoa, it’s not too late, you should start with this Charred Corn & Avocado Quinoa Salad. You will be hooked for life. For this salad, I used red quinoa because it’s what we had in our cabinet and I do love the color it adds. You can use regular quinoa if that is what you have on hand. I like to buy our quinoa in bulk at Whole Foods or at Costco. It’s pretty easy to find these days. The quinoa salad also has avocados and cotija cheese. They add a wonderful creaminess to the salad. Cotija cheese is a Mexican cheese and can be found at most markets. If you can’t find it, feta cheese is a good substitute. The cilantro lime dressing is light, refreshing, and simple to make! We’ve made this Charred Corn & Avocado Quinoa Salad several times and every time I love it more! I could eat it every day for the rest of the summer…and maybe I will! I think you should too! Enjoy! 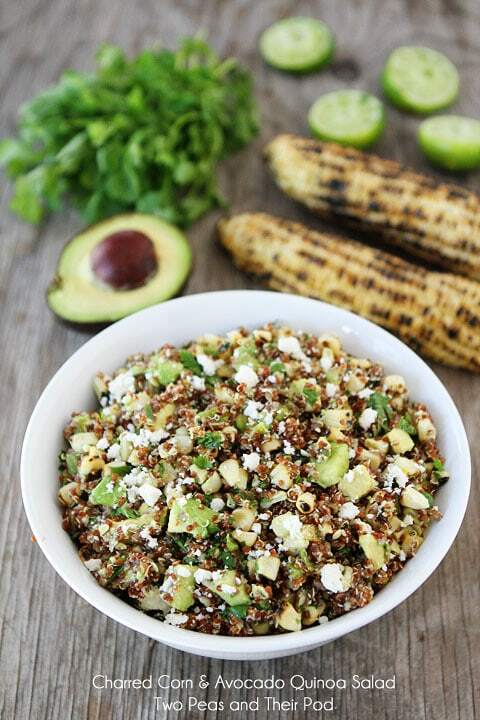 Quinoa Salad with charred corn, avocado, poblano peppers, cotija cheese, and a simple cilantro lime dressing. This gluten-free salad is a summer favorite! 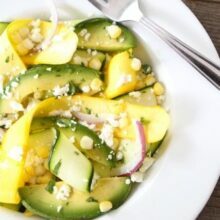 In a large bowl, combine quinoa, sweet corn, poblano peppers, cilantro, cotija cheese, and avocados. To make the dressing, whisk together olive oil, lime juice, garlic, cumin, cilantro, salt, and pepper in a small bowl. Pour dressing over the salad and stir until mixed well. Taste salad and season with salt and pepper, if desired. Serve immediately or chilled. Note-Place the corn and poblano peppers on a hot grill until they are black and charred. Remove the black skin on the peppers, and dice. If you can't find red quinoa you can use regular quinoa. Cotija cheese is a Mexican cheese and you can find it at most markets. If you can't find it, feta is a good substitution. This salad will keep in the refrigerator for up to 2 days. I am throwing charred corn into pretty much everything this year. So good! And avocado. Yes, I think I would like that very much! Nothing like charred corn in the summer! I simply love it! Yum!!! I can’t believe I’ve never charred corn. Must try it soon. Usually I don’t get for anything cook dark but maybe I’ll like it. Thanks for inspiration. I have tried to love quinoa — but I just can’t eat it. My tummy just does not want it! Any other grain suggestions for this yummy looking salad? Thanks! You could try farro, rice, or orzo? This salad is straight up summer in a bowl! Looks lovely! Love quinoa salads! I buy quinoa in bulk from Costco. I just recently grilled corn and loved it, so I can’t wait to try this! I am all about quinoa salads lately. I love the charred corn + cotija cheese in this one! Could you maybe share some tips on roasting peppers on the grill? I have only roasted them in the oven. Sorry I just saw that at the bottom of the recipe, but I can’t seem to delete my previous comment. Sounds like a great recipe. Any ideas on the dressing if you’re not a cilantro lover? You can never have to much quinoa or charred corn! I love this! Love this – you always have the best ideas! YUM! We’re having a party at my aunt’s this weekend- I think I need to bring this!! 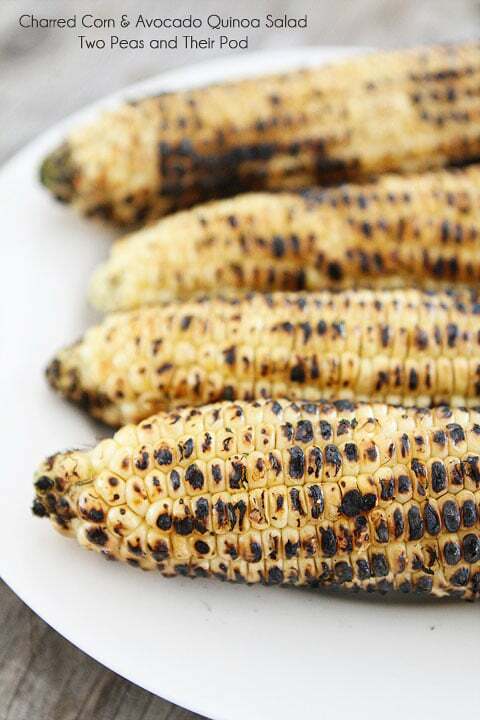 Love love love charred corn, you’ll see it in my salad Friday too. Mmm! Totally keep it up with this quinoa kick!! Totally gorg! I just love salads like this- it is so pretty and I am sure, delicious! this looks so pretty and delicious! i love that you used quinoa in this! 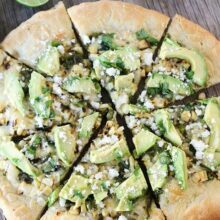 the charred corn and avocado is so up my alley! Such a great way to prepare quinoa! What kind of cheese would that be? You always come up with such terrific, festive salads. I need to revisit quinoa. I ran out quite some time ago, and I’ve seen too many good recipes utilizing it lately, this one included. Looks delicious! 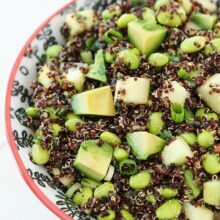 I could eat buckets full of this quinoa salad! Love the addition of corn! I like this recipe. Thank you and have a great day. I love dishes like this! So easy and delicious. I could eat “quinoa bowls” for every meal!!! Love grilled corn in just about anything! Great salad recipe! I tell ya, Maria. 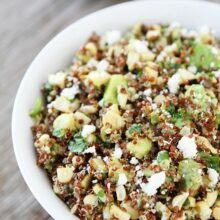 You make the most gorgeous, scrumptious lookin’ quinoa salads! This looks so delicious. The charred corn is such a great way kick up this salad! Love it! Maria – this salad is causing me great job, it looks like the perfect solution to a hot summery night! I am loving that charred corn! So amazing! Maria, this salad looks amazing! I can’t wait to try it. I make quinoa all the time for my family. I recently tried a salad from a local deli that I’m going to make at home. I think you might like it too. It’s quinoa, wheat berries, spinach, craisins, chopped mango, red onion, green onion, and an orange vinaigrette. So delicious! It reminded me of you. Totally sympathize with your quinoa obsession… this is beautiful! I don’t have a grill 🙁 would non-charred corn still be good in this? I am pretty obsessed with corn likely so I daresay you’re right….just one bite of this and I”ll be hooked! I just had this for dinner and HOLEY MOLEY! So delicious. Loved it. Love love love this! 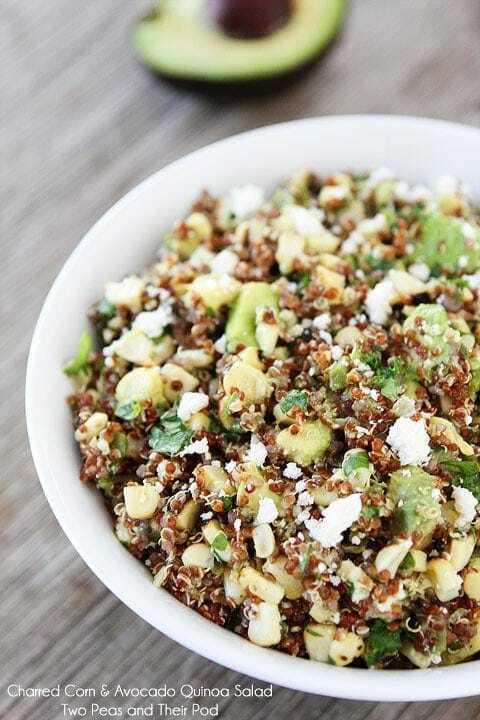 I love anything quinoa and the fact that you put charred corn AND avocado in it makes it pretty irresistible. Anyone who says that quinoa is boring needs to take one look at this salad – I’m sure their minds would be changed. This looks wonderful, Maria! I love quinoa too so you can keep the recipes coming! I love the charred corn too! 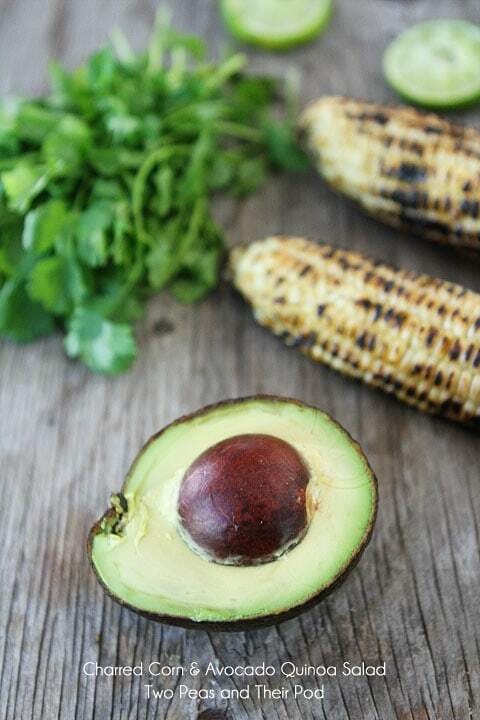 avocado, corn, and quinoa – 3 of my summer favorites. This salad looks incredible! EVerything about this screams, “Perfect”! I made this for a party last night. It was da bomb. I don’t ever remember a recipe being such a huge hit. Yummy!!! I am glad it was such a hit! We love it too! Quinoa is such a great pantry staple to have around. It pairs so well with avocado and I can’t wait to try it with corn! I haven’t had red quinoa yet. Does it taste different than white quinoa? Made this tonight and it’s really freshing and delicious!! I couldnt find the cotija cheese so i did the suggested alternative of feta and i think it was the perfect addition. Thanks so much! I have to admit my family is yet to try this healthy food. We have toyed with it but for some reason have not made the leap. This recipe might be the cog that pushes us over the top and makes us a quinoa convert. I do not know why we seem to have missed the bandwagon, as it really is a great food choice. Thanks for opening our minds. So many of my favorite flavors all in one! Oh friend .. <3 this! That looks amazing, hopefully the taste measure up to the look. 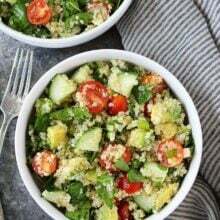 I am looking to incorporate quinoa based recipes into my cuisine this year, and this looks like an excellent addition, thanks for sharing. Tried this recipe and it is AMAZING! All these flavors together are just perfect for a summer meal! Thank you for sharing! So delicious. Every person I’ve shared it with has begged for the recipe. Thanks! I LOVE this recipe! Reminds me of chaskas on the beach (usually served as corn in a cup with lime, chile, cheese, cream in Mexico), but it’s not very good for you if you load it with cream. Anyways, thanks for the recipe. I included it on my blog where I collect healthy, tasty salad recipes from around the web. I’d love to add more of your salad recipes so please let me know if you don’t want me to use them.